For a traditional aesthetic with modern materials, choose double hung windows from Renewal by Andersen of St. Louis. This classic style of window has long graced homes across the country, and now Renewal by Andersen has crafted a more advanced window with the same iconic design. 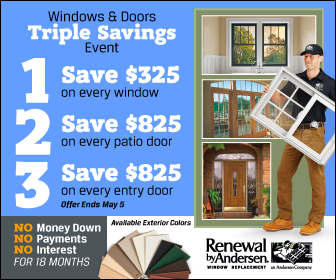 Renewal by Andersen crafts the highest quality double hung windows on the market. Their double hung windows are designed so that both sashes can be opened, leading to increased ventilation that other windows cannot match. They are also designed to tilt inward for easy maintenance, another feature that most other double hung windows do not have. But the real difference between a Renewal by Andersen double hung window and those produced by the competition lies in the materials. If you have a traditional sense of style but don’t want to stress over wood, vinyl, or aluminum windows, turn to Renewal by Andersen of St. Louis for double hung replacement windows. We’ll custom fit new, energy efficient double hung windows for you, helping to bring a touch of classic elegance to your home without sacrificing the modern materials that are a large part of The Renewal Difference. To learn more, give us a call or fill out our Request an Estimate form to schedule a FREE in-home consultation with our St. Louis windows experts.